Ditch all those old controllers and use your Lynk to navigate all your TVs, computers, gaming consoles, and media streaming players. The Lynk universal remote control for TV and computer is much more than your average everyday remote; integrated with AI technology, it is capable of learning key functions of your other remotes as well as doing everything that a full Windows Keyboard, Air Mouse, Remote Control, and Microphone can do. Built in a duo-faced style, the Lynk features a front face with essential navigation keys, such as the D-pad to select channels, play/pause, volume controls, and power button. It also has special keys such as the Windows start, I.R Learn, and Input Microphone. When you flip the Lynk, you’ll see a full Windows keyboard that’s perfect for easy search. Use the keyboard to find your favorite titles quicker on apps like Netflix and Hulu. You can even pair the device with an Azulle mini PC or mini PC stick to effortlessly search the web and make edits to your personal documents as an alternative to a full mouse and keyboard setup. The QWERTY keyboard can additionally be back-lit by pressing a light button found on the side – a nice feature to take advantage of when streaming in the dark. The 6-axis gyroscope technology lets the Lynk work as an air mouse. This mobility makes navigating through slideshows a breeze, as you can simply use the Lynk as a handheld pointing device to control your visual powerpoints at the wave of a hand. You can even make your presentation interactive, by using the keyboard to type in extra notes to as you speak and walk through the room. The Lynk universal remote control for TV and computer is integrated with voice recognition software. Click the designated “microphone” button found on the front face of the device to take command over smart digital assistants like Cortana and Google Search by Voice. Make requests, like “Hey Cortana, launch Google Chrome” or ask a question to find out answers and directions you need. 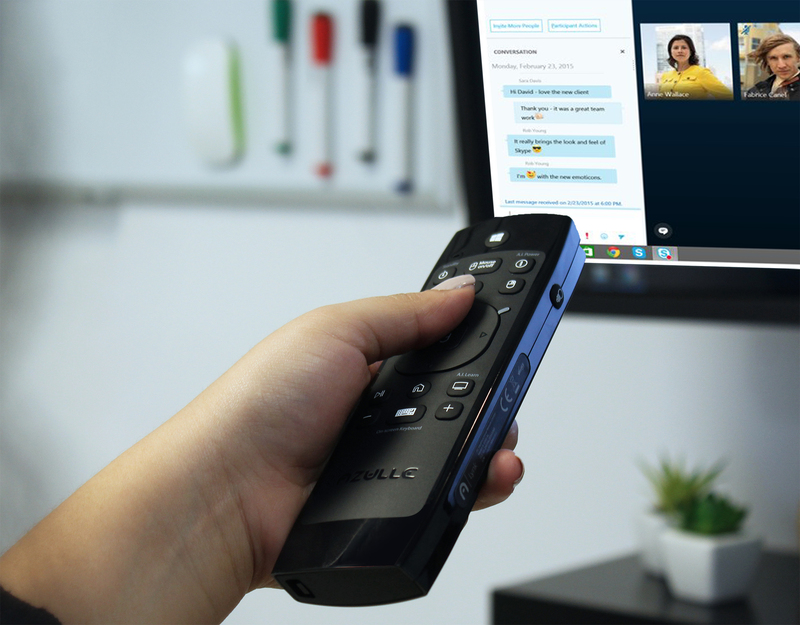 The built-in mic can also be used for video chat calls. Join online business conferences or friendly conversations on apps like Skype and Google Hangouts. the Lynk Multifunctional Remote Control is the perfect companion to control all your devices, as it makes surfing your TV easy as possible, while also being functional for business application at the office or conference rooms. Who can complain about that much versatility?